While influencer marketing is here to stay, there are some things you need to know first before you go and think your campaign is going to go viral. Getting people to talk about your product or service sounds like it should be easy-peasy and that if people love your product they are just going to sing it from the mountaintop. Sometimes this happens and there are some vocal people out there who are constantly giving their opinions on things and love to recommend items to their friends. We love these people! However, they are not the majority. So getting free publicity isn’t always an option. A good influencer marketing campaign has a lot of moving pieces and it does cost money. First there is your time. Your time in finding and creating strong relationships with Influencers is not free. It’s also not as quick as you’d like to think. Beyond your time, you have to think about what you are going to give these people in return for promoting your product. Maybe it’s free product, maybe it’s money or compensation. Whatever, it is, there is a cost associated with it. Next you have to produce the assets. These can be online assets like videos, graphics and even paid ads. All of these things cost money. But it is worth it because the return can be very high. For every dollar spent on influencer marketing, you can make back about $6.50 in earned media value. So. the value is definitely there, but don’t go on thinking that it is free. Because there is no such thing as a free lunch. Or a free marketing campaign. Everyone has something they are passionate about. When you are passionate about something you usually have influence over someone else about that topic. People are drawn to those who know a lot on a subject matter. We tend to trust their ideas and opinions more than others who might not know about the topic. Don’t be afraid to gather influencers from all types of networks and walks of life. The more diversified you are, the better your results will be. Influencer marketing is a mutually beneficial relationship. This means the relationship the influencer has with the business needs to be as equally beneficial to them as it is to you. You can’t go into it one sided and selfishly. It needs to make sense for both parties to work. Trust me on this. Before you start thinking about all these big time Vine celebs, think about your customers as the first place to look. They already know you. They already like you. And they already have a relationship with you. Start with them and build outwardly. 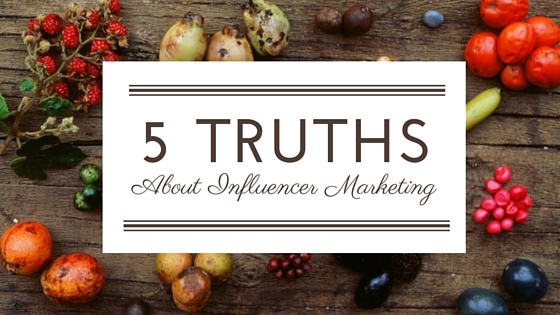 Like I said in #2 and #4, your influencers don’t necessarily have to be HUGE names. They more focused the audience is, the more likely you are to see results. This means that 100 highly targeted people learning about your company from an expert can bring you more results than a celebrity who has a million followers who would never buy your product. The more niche, the more tight-knit, and sometimes smaller the community, can actually mean bigger returns.